Effortlessly cook up your favourite meals with the Bergner 5 Piece Pandora Copper Non-Stick Frypan Set. 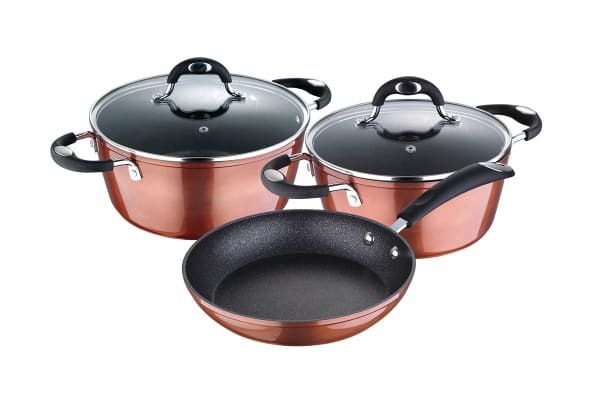 The Bergner 5 Piece Pandora Copper Non-Stick Frypan Set is perfect for all your cooking needs. Including a frying pan (24 × 4.7cm), 2.4L casserole pot with lid (20 × 9cm) and a 4L casserole with lid (24 × 10cm), you will be set to make any meal. The forged aluminium and copper ensure an even heat distribution and a durable build to last all cooking rigour. The scratch-resistant surface and non-stick mable coating ensure your pans don’t scratch, food doesn’t stick to the pans and cleaning is always fuss free.